EFFORT: Medium to Hard skiing. Big days out. 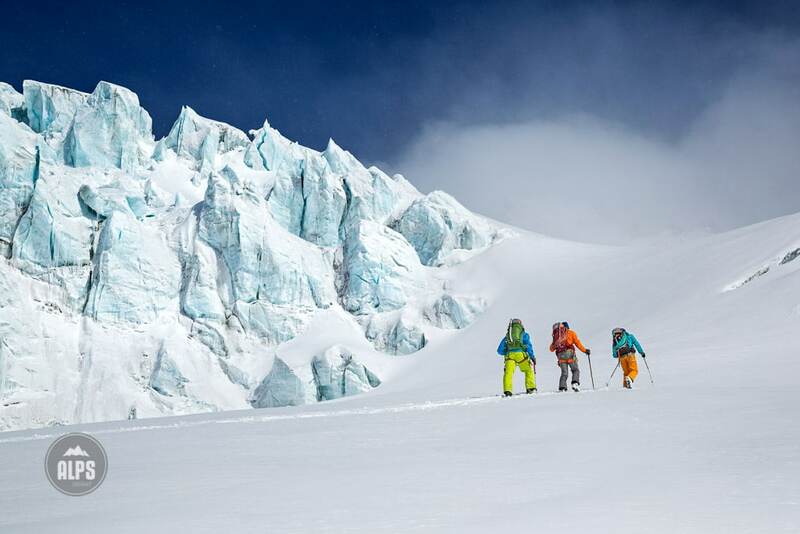 Glacier skills mandatory. 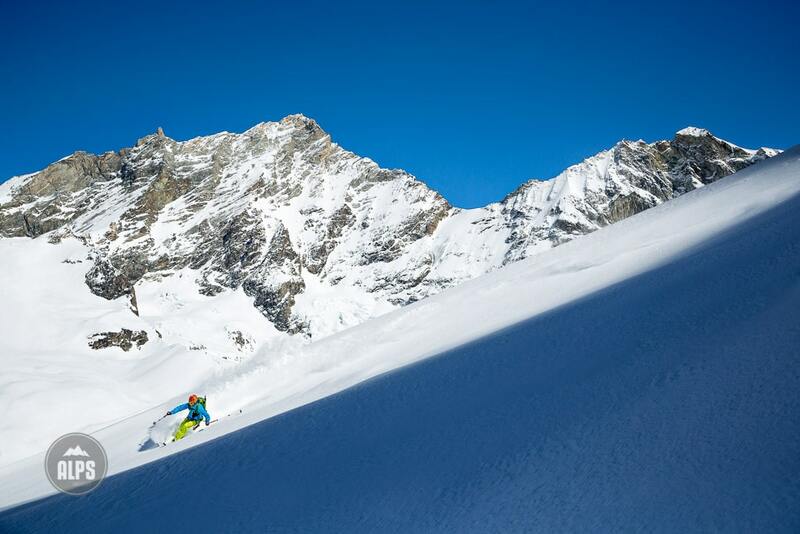 Most ski tourers visiting the Alps seek a multi-day, point to point tour. A program, with an agenda, with little room for modification. 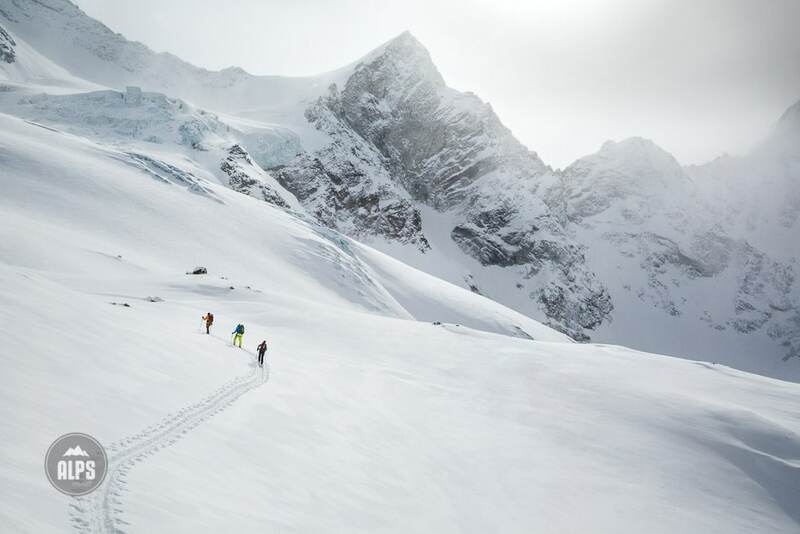 But what if... you settled in to one hut, got to know the hut keepers, carried an even lighter pack each day, and spent your two or three days touring in some of the most stunning terrain in the Alps? All with descents that drop you right back to the hut. Then, on your last day, you skin a peak directly above the hut, and drop 2000 meters back to your starting point. This is sounding pretty good, right? It exists! At the very end of the 4000 meter peak rimmed Val d'Anniviers, from the last village of Zinal, you start skinning up the Glacier de Zinal, for about 5 hours, to the Cabane du Grand Mountet. 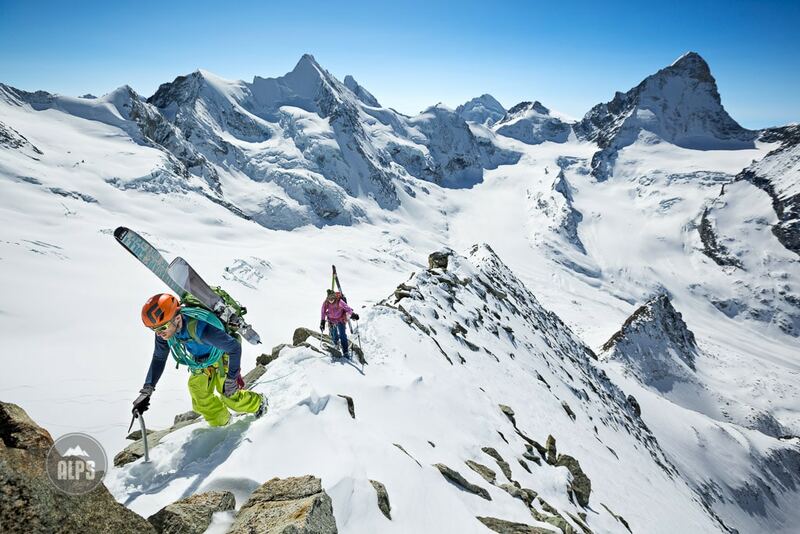 From the hut, there are a few classic ski tours. The most obvious is the Trifthorn, a 3728 meter pyramid with a perfect north facing ramp leading off its summit that gets steeper as you get higher. There is also the Point de Zinal, 3789 meter, which is essentially a ski approach to the Col Durand, then an AD alpine ridge climb. 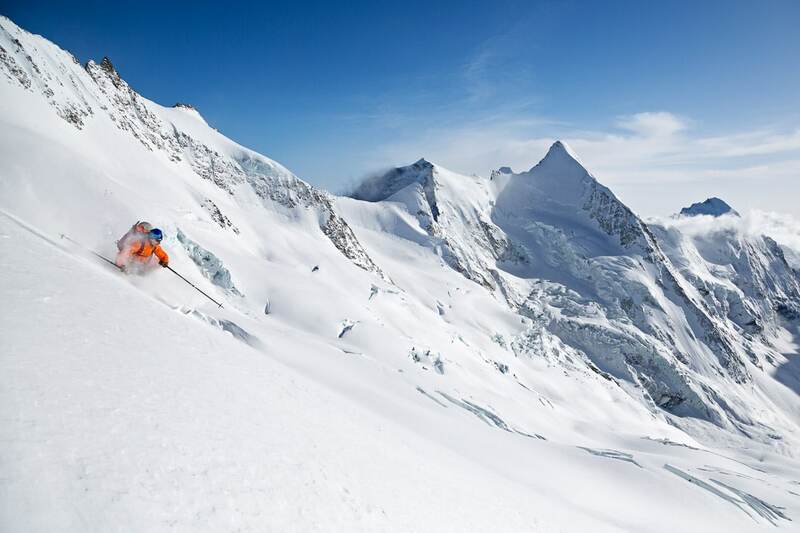 This may also be done as an out and back glacier ski tour in spectacular terrain. 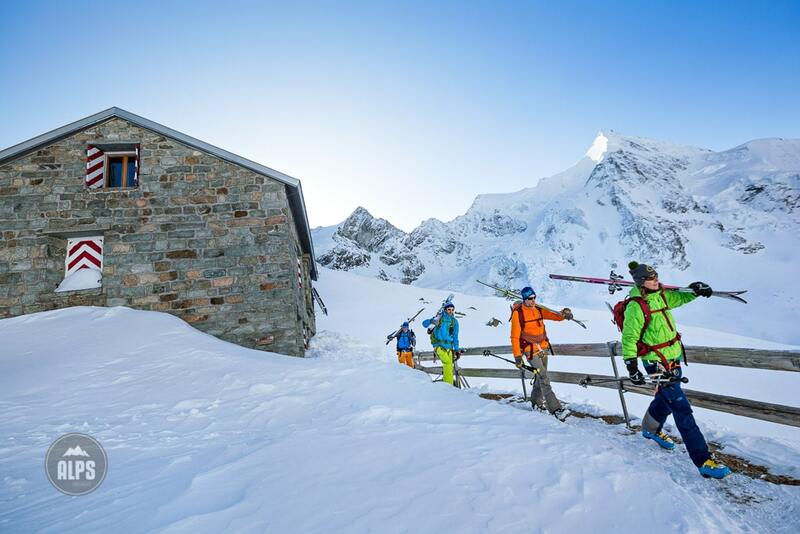 L'Epaule is a point 1000 meters northeast of the hut and can be done as a long glacier tour out and back, or with an option to cross over to the north side of a ridge and ski back to Zinal. And finally, for your last day, one of our favorite descents. Nail the right conditions and you are in for a treat. 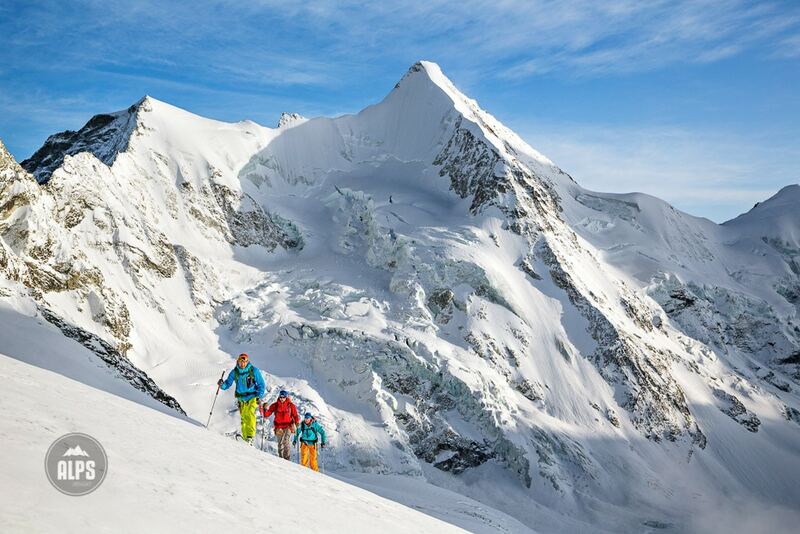 North of the hut, you'll skin increasingly steep terrain to the base of the southwest ridge of the Blanc de Moming. Once on the ridge, you'll carry skis and climb (F but exposed) the rocky ridge to the summit of the Blanc De Moming at 3651 meters. From the summit, descend east to avoid crevasses* before coming back west beneath them to a rock wall. The hut keeper advised us to go to the very base of the wall and seek a natural half pipe that holds good snow. He was very right. We skied perfect untracked powder for over 1000 meters. Finally, once back into the trees, you'll turn left and head back to Zinal. *Crevasse zones change year to year. Pay attention! TIP: This is a special trip to a place that feels unusually wild for the Alps. 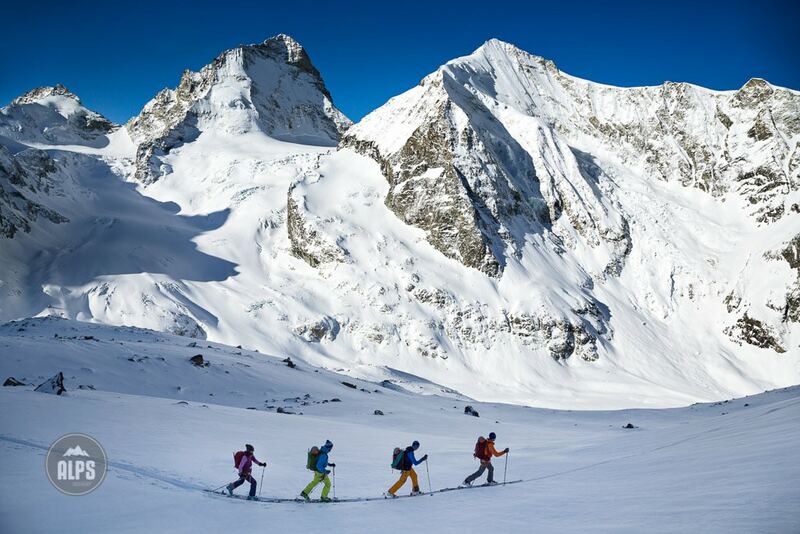 And, like all glacier ski tours, if you aren't 100% solid in glacier travel, rescue, and skiing - go with a guide. 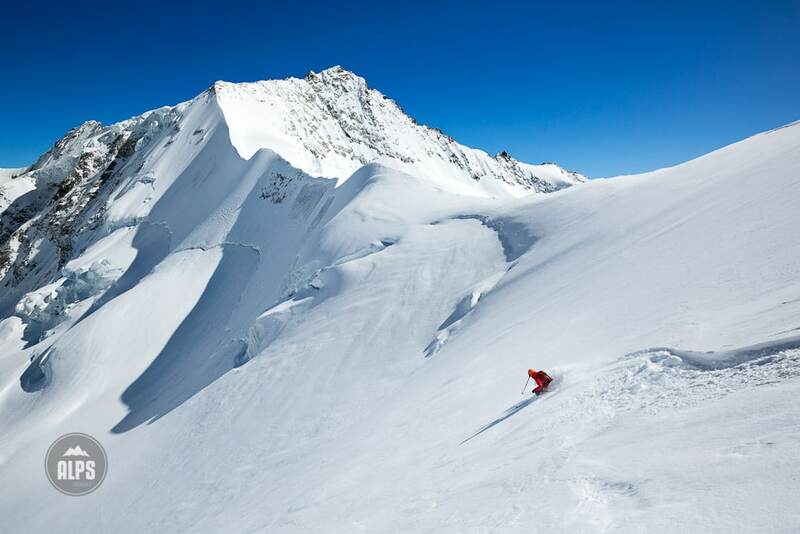 Finally, spend at least one night in Zinal at the Hotel Le Besso. This is without a doubt one of our favorite hotels and restaurants in all of Switzerland, complete with house crafted microbrews. 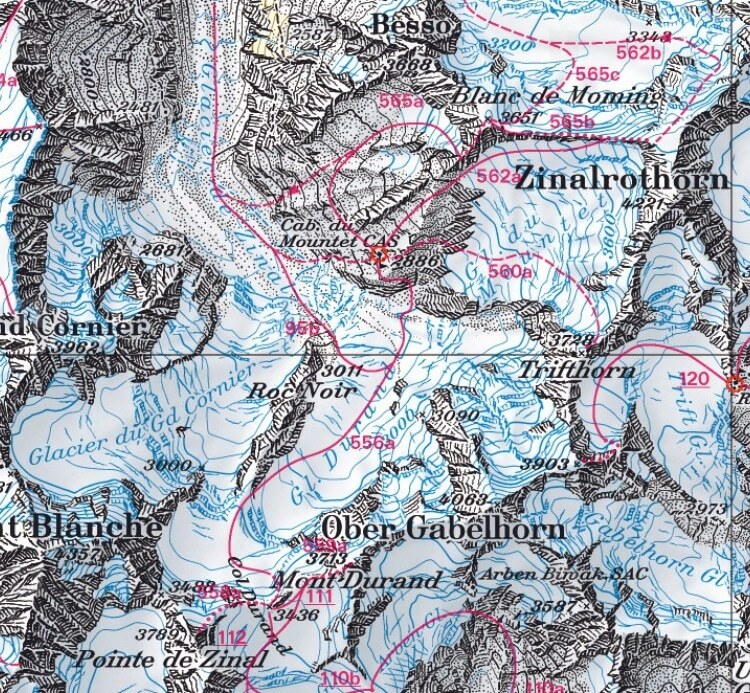 MAP: Touring south from the town of Zinal, skiers arrive to the abundant ski touring potential around the Cabane du Mountet, including the Trifthorn and Blanc De Moming. 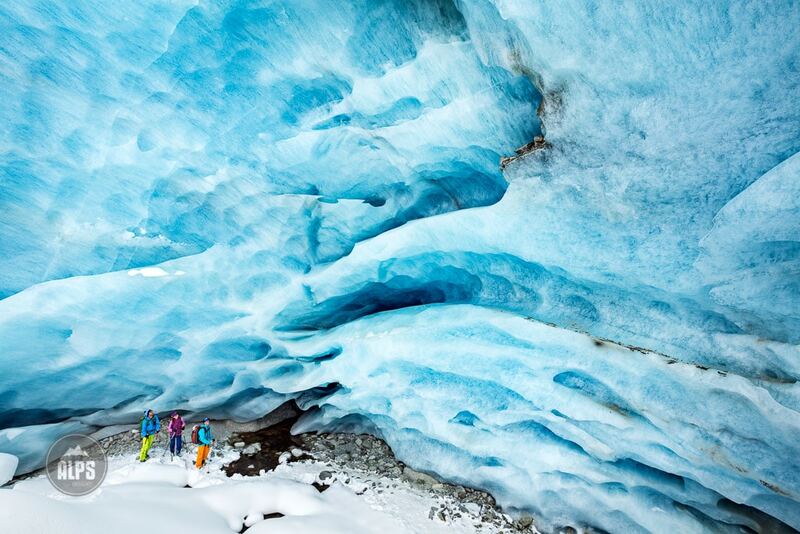 Exploring the Glacier de Zinal. Another day from the Cabane du Grande Mountet. The track, right out the door of the hut, for the 3728 meter Trifthorn, ahead. 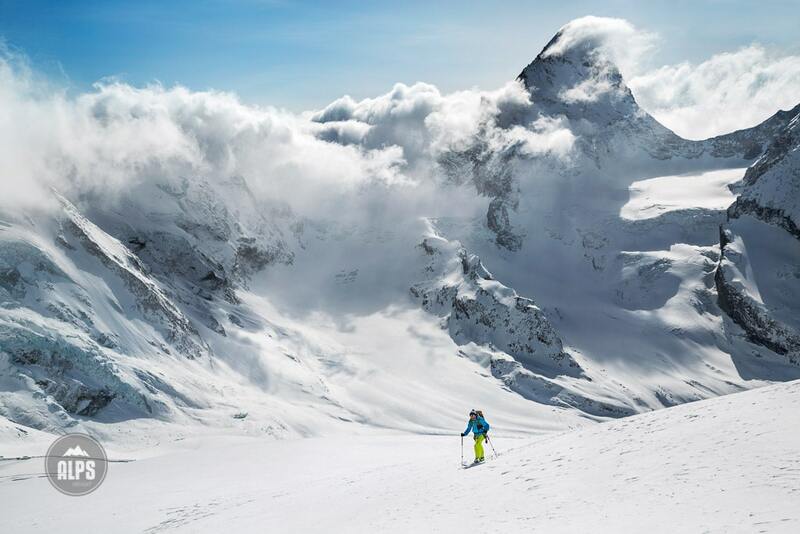 The mighty north face of the 4063 meter Obergabelhorn is a constant companion. Heading for the Blanc de Moming. The 4357 meter Dent Blanche puts things into perspective. Climbing the ridge to the summit of the Blanc de Moming. The first turns dropping off the summit of the Blanc de Moming onto the Glacier de Moming. Skiing the Glacier de Moming.